Merton, Robert C.; Foreword by Paul A. Samuelson. Oxford and Cambridge, MA: Basil Blackwell, 1990. First edition of Merton’s landmark work, which introduced the concepts of continuous-time optimization, inscribed by Merton to fellow Nobel Prize-winning economist Kenneth Arrow. Octavo, original cloth. Foreword by Paul A. Samuelson. Association copy, inscribed by the author on the title page to Kenneth Arrow. Additionally signed by Paul A. Samuelson at his contribution. Near fine in a near fine dust jacket. Robert C. Merton is known for his pioneering contributions to continuous-time finance, especially the first continuous-time option pricing model, the Black–Scholes formula. The Black–Scholes–Merton model is a mathematical model of a financial market containing derivative investment instruments. From the model, one can deduce the Black–Scholes formula, which gives a theoretical estimate of the price of European-style options. The formula led to a boom in options trading and provided mathematical legitimacy to the activities of the Chicago Board Options Exchange and other options markets around the world. lt is widely used, although often with adjustments and corrections, by options market participants. Many empirical tests have shown that the Black–Scholes price is "fairly close" to the observed prices, although there are well-known discrepancies such as the "option smile". Based on works previously developed by market researchers and practitioners, such as Louis Bachelier, Sheen Kassouf and Ed Thorp among others, Fischer Black and Myron Scholes came to the formula in the late 1960s. In 1970, after they attempted to apply the formula to the markets and incurred financial losses due to lack of risk management in their trades, they decided to focus in their domain area, the academic environment. After three years of efforts, the formula named in honor of them for making it public, was finally published in 1973 in an article entitled "The Pricing of Options and Corporate Liabilities", in the Journal of Political Economy. Robert C. Merton was the first to publish a paper expanding the mathematical understanding of the options pricing model, and coined the term "Black–Scholes options pricing model". Merton and Scholes received the 1997 Nobel Memorial Prize in Economic Sciences for their work. 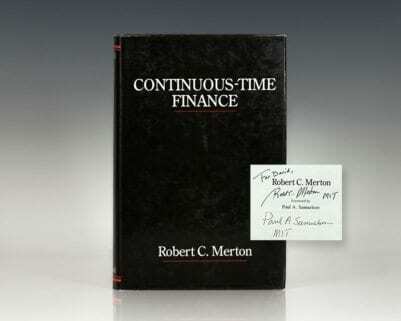 First edition of Merton’s landmark work, which introduced the concepts of continuous-time optimization. Octavo, original cloth. Foreword by Paul A. Samuelson. Inscribed by Robert C. Merton on the title page. Additionally signed by Paul A. Samuelson on the title page. Fine in a fine dust jacket. Rare and desirable signed by these two Nobel Prize-winning economists.